While you don't need to own a BlackBerry Smartphone to go out and buy a BlackBerry PlayBook tablet, if you do own both BlackBerry phone and tablet you can take advantage of the BlackBerry Bridge, which connects your tablet to your phone, allowing your tablet to act like a big touchscreen for your phone providing direct access to your phone's email, calendars, BBM files and other data. In order use the BlackBerry Bridge, you first have to install the BlackBerry Bridge application onto your phone, and from there pair your phone to your tablet. This tutorial goes through the process, so keep on reading to learn more about using the BlackBerry Bridge! If you are running BlackBerry Device Software 5.0 or later on your BlackBerry smartphone, you can connect your BlackBerry PlayBook tablet to your smartphone to access email, calendars, BlackBerry Messenger files, and other data directly from your tablet. Your tablet connects to your smartphone using Bluetooth technology. 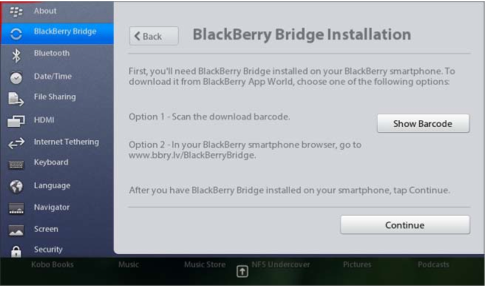 To connect, you need the BlackBerry Bridge application installed on your smartphone. You can download it from the BlackBerry App World storefront. You can download the BlackBerry Bridge application using a barcode, or by searching BlackBerry App World. On your tablet home screen, on the status bar, tap settings	> BlackBerryBridge. If necessary, enter a name for your tablet. On your smartphone home screen, click App World. To scan the barcode, point your smartphone camera at the barcode that appears on your tablet. 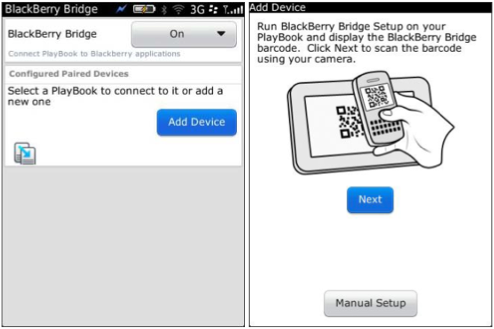 On your smartphone, click the BlackBerry Bridge application. 6. Click Download. 7. Enter your BlackBerry® ID login information. 8. If necessary, enter your smartphone password. On the home screen, click App World. On the Featured Items screen, press the Menu key. Click the BlackBerry Bridge application. Enter your BlackBerry ID login information. If necessary, enter your smartphone password. 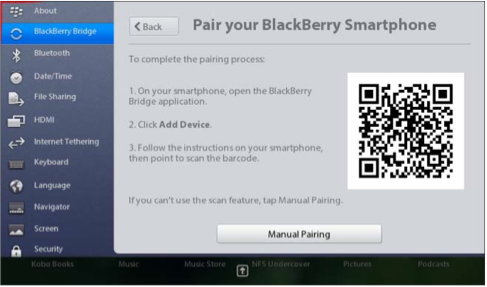 You can connect your tablet and smartphone using a barcode and the BlackBerry Bridge application, or by manually pairing using the BlackBerry Bridge application. 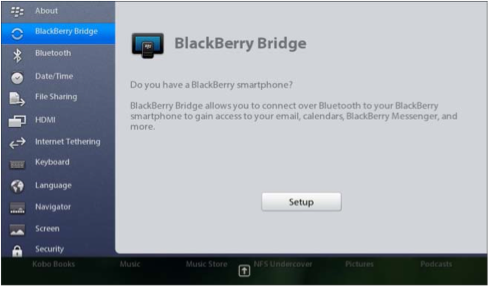 Please note, to connect your tablet and smartphone, the BlackBerry Bridge application must be installed on your smartphone. On your tablet home screen, on the status bar, tap settings	> BlackBerry Bridge. In the BlackBerry Bridge application on your smartphone, click Add Device > Next. Tap Next > Continue > Manual Pairing. In the BlackBerry Bridge application on your smartphone, click Add Device. Select the tablet from the list. Confirm that the pairing number is the same for the tablet and smartphone, and click Yes. Saved Wi-Fi networks and bookmarks from the Browser application on your smartphone are available on your tablet. When your tablet and smartphone are not connected, the applications appear as unavailable on your tablet home screen. Note: BlackBerry Bridge connections are only available on your tablet when your tablet and smartphone are connected. When your tablet and smartphone are disconnected, the connections are removed from your tablet, but remain on your smartphone. IT Policy: For administered BlackBerry Smartphone users, a new IT policy exists called Enable BlackBerry Bridge which specifies whether a smartphone can run the BlackBerry Bridge application. If this rule is set to True, a smartphone user can run the BlackBerry Bridge application and use it to connect the tablet to the smartphone. 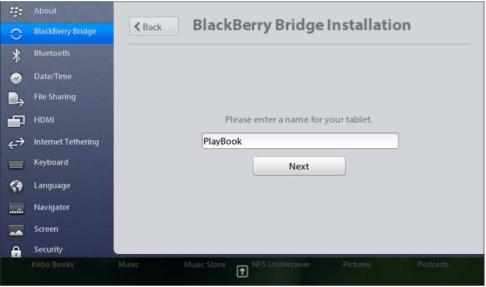 If this rule is set to False, a smartphone user cannot run the BlackBerry Bridge application and cannot use it to connect the tablet to the smartphone.